A second purpose of the exercise was to generate spatial data which could be digitised and used as part of wider effort supporting community-based conservation in Ulu Papar. 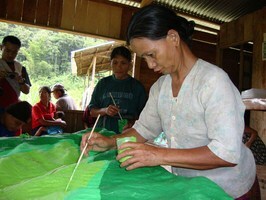 Community researchers from Ulu Papar constructed the model over a period of five days in November 2010. The completed blank model was subsequently transported to Kalanggaan village in Ulu Papar, where it was stored in a central location easily accessible to community members. In August 2011, a workshop was held in Kalanggaan in which local residents developed a map legend first and later on located the various features on the model using paints and pins. The model (192 km2) was built by representatives from the communities of Kalanggaan, Pongobonon, and Longkogungan in Ulu Papar, the Global Diversity Foundation, and Sabah Parks. The completed model is currently housed in Kalanggan village, which was chosen as it is the most central location in Ulu Papar, and therefore provides the most convenient access to residents. Community members have agreed to periodically update the model with new information during future workshops. Initial model data have been imported into a GIS and used as part of wider research aimed at documenting local land use practices and provide supporting evidence on the fact that the communities are de facto the custodians and conservation managers of Ulu Papar.